Nose reshaping can really alter the overall appearance of the individual, it is a very popular procedure and brings patients more confidence and self esteem. Often noses can be disproportionate to the rest of the face, this can be from birth or through accidents and disease. There are different types of reshaping depending on the individual but your specific options will be discussed with your surgeon at your consultation. The operation is performed under local or general anaesthetic depending on the extent of surgery. During surgery an incision is made in or around the nose to separate the tissues. Once this is complete the nose is then ready for re-shaping or re-structuring. The operation will take approximately 2 hours but again this depends on the surgery being carried out. The operation is carried out under general anaesthetic and takes approximately 2 hours, once you have woken up you may feel headachy and constricted around the nose and the mouth will feel dry, this is all perfectly normal. Q: What is the bruising like? It varies from person to person, the nose will swell, and some people will have black eyes and swelling of the cheeks. Q: Will I be able to breathe through my nose? Initially the nose will feel very blocked, during the first 2 weeks this will ease as the swelling reduces. Q: Will I like the shape of my new nose? 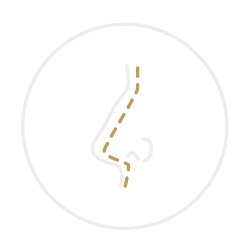 At your consultation the surgeon will realistically explain what he can achieve with the shape of your nose taking into account your own expectations.